Software News : OWB 1.7 for MorphOS is out! Re: OWB 1.7 for MorphOS is out! I would like to know.... OWB is open source isn't it.....soooo..... are the MorphOS, AmigaOS4 and AROS ports entirely different code bases? Do they not need to share the code? For instance, here's how it can look like on MorphOS. Quite different from OWB OS4 or even OWB for AROS (even though it uses Zune). And that's just the GUI. Last edited by Fab on 05-Mar-2010 at 02:29 PM. There is a flash plugin too, anyway (but it's not fast enough for youtube, except on mac mini). Last edited by Fab on 05-Mar-2010 at 02:57 PM. No but seriously.. this is nice. youtube runs pretty nice at 60-70% load n my 1.5 GHz mini. Somehow I lost sound after thefirst video. Wlll try again. Anyway, Fab is the man! Keep in mind it's using AHI exclusive unit. If you want several sounds at once, you'll have to use the device.audio mode (that redirects music unit to device unit). No, I don't mean parallel sound instances. I can play only one video. Once that is finished, another video from tha same tab does replay mute. Seems like the player hasn't cleanly exited. Edit: The taskmanager tells me that "[OWB] MediaPlayer Video" froze. Last edited by Zylesea on 05-Mar-2010 at 03:31 PM. It exits cleanly, unless something died, of course. Last edited by Fab on 05-Mar-2010 at 03:36 PM. Last edited by Fab on 05-Mar-2010 at 03:32 PM. Rebooted to flush everything. Now, in a controlled testbed (only aw.net & youtube open ins one tab only) it does work as expected on first sight. opened youtube, searched for Alan Ashita (to get ti know what Tokai is listening to). worked. Selected another vid from teh suggestion worked. After the 2nd vid was finished entered onother search string, and then no audio output worked. Taskmanager doesn't report me a frozen task this time. 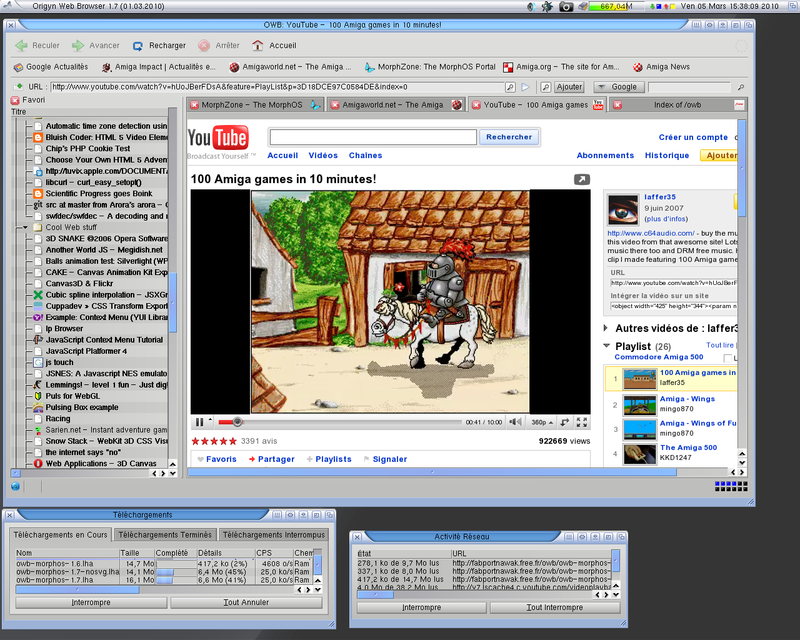 For sure having firefox or any other fox on the morphos will no make sense anymore, because OWB are the modern and full of features browser. Sadly that OWB for aos4 are far-far away from morphos one. But anyway, very interesting news.